Cherry and Martin is pleased to announce it now represents Tomory Dodge. Tomory Dodge is one of the most important painters working in Los Angeles today. Over the course of his career, Tomory Dodge has become known for dynamic paintings that explore the representation and mechanics of picture-making. Thanks to mass media and modern technology, images today are on every conceivable surface and confront us at every moment. Painting, one of the oldest means of expression, remains a vital key to understanding the nature of images in modern life, whether they are experienced in the physical world, on our devices, or on-line. Painting’s power to represent images and events means that we often forget the fact that paintings themselves are a matrix of applied material signs. The vision of the painter and the subjects that they depict are figured through brushstroke, color and texture. Tomory Dodge’s works explore this intersection. An early painting, “Night Test” (2003) depicts the contrail of a Minuteman II ICBM, launched from Vandenberg Airforce Base north of Los Angeles. The contrail is a swirling painterly abstraction; at the same time, Dodge’s brushstrokes witness the awesome power of humans and their creations (for better or for worse). The trail of the rocket snakes eerily across the night sky, lighting up the homes of millions. In recent works, Dodge has edged towards abstraction. He comments, “Paradoxically, similar to analytic cubism perhaps, the attempt to understand something in its totality often results in partially obscuring it.“ Within Dodge’s large oil-on-canvas paintings, many smaller ‘paintings’ seem to jostle together, making room for themselves within the greater composition. Dodge’s practice is both additive and reductive. He paints over older moments and scraps away, finding the painting within the painting, to reach the final form of the work. In addition to his skill as a painter, Tomory Dodge is also a skilled musician, with a particular interest in a form of electronic music called “modular synthesis.” This is a type of music-making involving synthesizers in which any output from any stage in the signal past can be used as the starting point for new compositions. Dodge’s music practice finds a parallel in his art practice, as his paintings function in a similar fashion. They grow upon themselves, as layers are recovered after being uncovered, and new layers are built. “I do see painting as a kind of recording and recording as a kind of painting.” he says. Dodge’s work succinctly addresses the looping nature of human experience and the problematics of modern society, its representations, and the role of painting in exploring them. Tomory Dodge (b. 1974, Denver, CO) received his BFA from the Rhode Island School of Design in 1998, and his MFA from the California Institute of the Arts in 2004. 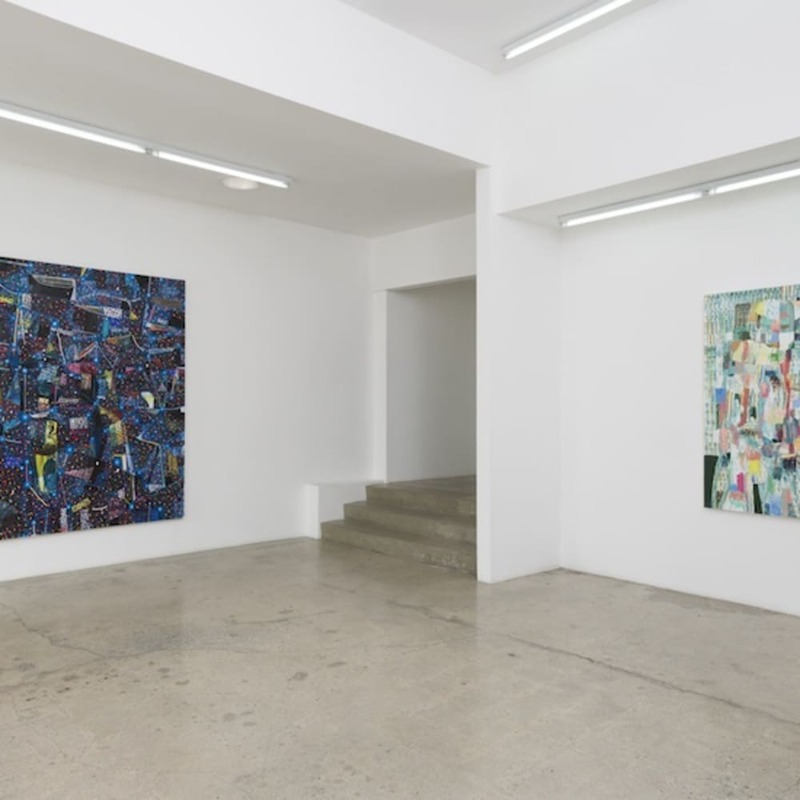 Dodge’s work is the subject of several monographic catalogs and has been discussed in such publications as Art Forum, Flash Art, Modern Painters, Art Review, Los Angeles Times and New York Times. His work is in the collections of such museums as Berkeley Art Museum, Berkeley, CA; Henry Art Gallery, Seattle, WA; Dallas Museum of Art, Dallas, TX; Knoxville Museum of Art, Knoxville, TN; Los Angeles County Museum of Art, Los Angeles, CA; Nerman Museum of Contemporary Art, Overland Park, KS; Orange County Museum of Art, Newport Beach, CA; Orlando Museum of Art, Orlando, FL; RISD Museum, Rhode Island School of Design, Providence, RI; San Francisco Museum of Modern Art, San Francisco, CA; Smithsonian American Art Museum, Washington, DC; Whitney Museum of American Art, New York, NY; Weatherspoon Art Museum, Greensboro, NC; Yale University Art Gallery, New Haven, CT. Dodge lives and works in Los Angeles.